"Yippee-ki-yay, (you know the rest)!" 1. Die Hard (1988). The first installment remains the best with Bruce Willis finally finding a role that fit his persona. Indeed, this was the film that probably saved his big-screen career after the lukewarm boxoffice returns of Blind Date and Sunset. The tidy plot thrusts NYC detective John McClane-- a resourceful, likable hero--into the middle of an apparent terrorist attack in a near empty L.A. high-rise on Christmas Eve. In film industry slang, this is a "high concept" movie, but also a very smart one. McClane's shaky marriage humanizes our hero, the confined setting is exploited to maximum effect, and Alan Rickman provides a marvelous villain. I love how McClane thinks out loud through much of the film, making the viewer his silent partner. But just to ensure that doesn't grown weary, police officer Al Powell (Reginald VelJohnson) becomes his unlikely "partner." After watching Die Hard again just recently, I was pleasantly surprised at how well this excellent action film holds up. 2. Die Hard 2 (1990). Although it was a huge boxoffice success, many moviegoers and critics carped that this first sequel was an unimaginative carbon copy of the original. That's true to some extent: the setting--an airport this time--plays an important role; McClane gets help from an unlikely ally (Marvin, the janitor); and the authorities ignore McClane, forcing him to take down the bad guys on his own. Yet, despite the air of familiarity, Die Hard 2 nimbly navigates from McClane's impromptu investigation to the criminals' scheme to an amusing subplot with McClane's wife Holly (Bonnie Bedelia) aboard a jet. The action scenes are exceedingly well-staged--the shot of McClane in the ejection seat is perhaps the most iconic one in the series. Personally, I love the airport setting (and often wonder why it's not used in more films). Jackson and Willis listen to a riddle. 3. Die Hard With a Vengeance (1995). While the desire to shake up the series is understandable, the third installment is a significant departure--and also my least favorite in the series. One problem is that the script was originally not a Die Hard movie at all. Jonathan Hensleigh wrote a "spec script" called Simon Says that was once considered for the fourth Lethal Weapon movie. 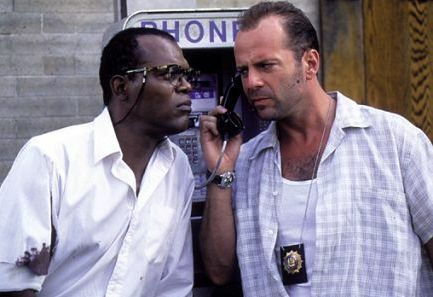 Instead, it was revamped into Die Hard With a Vengeance with Willis and Samuel Jackson as an unlikely team forced to take on a riddle-making villain who uses terrorist attacks to mask his real crime. There's a dandy subway station sequence, but this is just another "buddy film" at heart and, as much as I admire Jeremy Irons, his villain is flat and uninteresting. Without his family, McClane comes across as just another independent-minded, big city cop. An older McClane returns to form. 4. Live Free or Die Hard (2007). After a 12-year gap, McClane returns with a new "partner"--a young computer geek--and a spunky daughter who has issues with her old man. Interestingly, it borrows some elements from Die Hard With a Vengeance, specifically the "buddy film" structure and the villains' use of one crime to facilitate a greater one. Willis and Justin Long work well together (as did Willis and Jackson), but the chief upgrade over the third installment is Timothy Olyphant as the second-best Die Hard baddie. He plays a former government security expert who wants wealth--and to make his former bosses look like idiots. 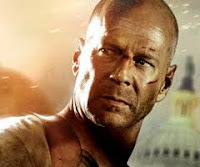 It's also nice to see McClane trying to connect with his daughter again (although putting her in peril at the climax seems unnecessary). Evaluating each film on its own merits, my ranking from best to worst is: Die Hard; Die Hard 2; Live Free or Die Hard, and Die Hard With a Vengeance. Overall, the Die Hard films hold up well and comprise an entertaining action film series. I am feeling a little older realizing that "Die Hard" came out 25 years ago. I like Bruce Willis quite well in these works but am not a fan of terrorist bad guys in films meant to entertain. I did enjoy your post, Rick, and hope you have a happy Valentine's Day! I had a lovely Valentine's Day, Toto. I agree...it doesn't seem like the first DIE HARD can turn 25 this year! I love all the "Die Hard" movies and agree that the first is the best. It had Alan Rickman! I also like Sgt Powell and missed him in the latter film. He and McClane made a great team, even though they didn't fight Rickman's gang together. Rick, I'm in complete agreement with your order. BTW I worked with someone who had screen credit as a special thanks on Die Hard 2 Larry Waterman of Proton, he also had credit on The first version of Total Recall. Interesting! Do you know what Larry received a thanks for? Proton did all of the video screens and TV's in both films, Larry was Protons rep . 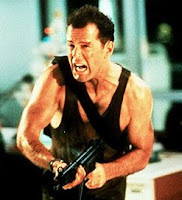 I really liked the first Die Hard movie -- like Anonymous, it was largely due to Alan Rickman! I didn't see the others -- I'm not a big action fan and just didn't. I have read that the recent Die Hard movie is a bit of a flop. Have you seen that one?